Thanks for being patient BH fans new and old. It took some doing but I tracked down and chained to a chair (jk) Dread & Alive series creator Nicholas Da Silva and managed to squeeze all the juice we possibly could about the man behind the music and the comic! BH fans…. prepare….. :)…. have I got an interview for you! Q0. Tell our readers a bit about yourself. 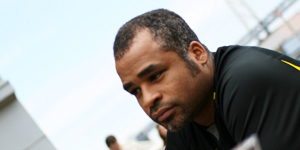 I am the founder and creative director of ZOOLOOK, a San Francisco-based new media agency I established back in 1996 that develops entertainment properties for the web, video, television, film and wireless entertainment. I’m also a graphic designer specializing in print, web and video, and a musician. snowboarder, traveling around the world, looking for the perfect snow. Q1. 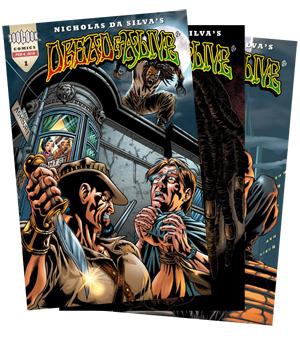 Can you tell us about the Dread & Alive series? A1. 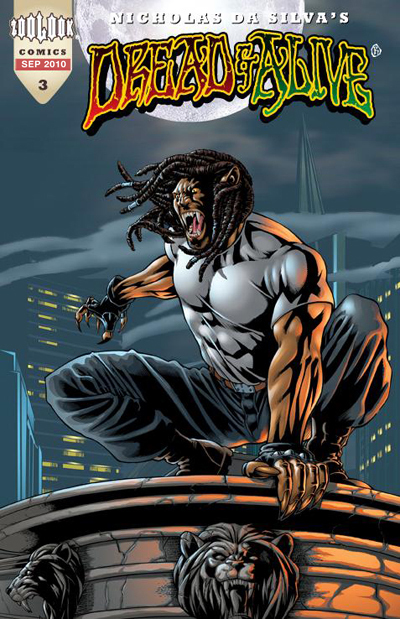 Dread & Alive is the first comic book of its kind with a Jamaican protagonist. 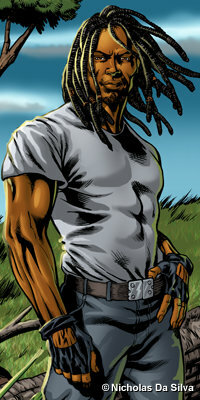 The hero, Drew McIntosh, is inspired by the Jamaican Maroons, ex-African slaves who fought back the British and escape into the Cockpit Country of Jamaica where to this day, they govern themselves and are recognized as being independent. The story meshes fact with fiction while offering an insight to the ways of the Jamaican Maroons. The series is also the first to feature a cd collective featuring the best in conscious reggae music. The story follows Drew as he travels the planet with his partner, zoologist Brandy Savage and his mentor, Cudjoe, wise and benevolent village chief of the Maroons, as they confront the forces of babylon in an effort to protect the earth and all its inhabitants. Q2. What prompted you to create this series? A2. As a kid, my dad would always take me to the library which I found fascinating. To me, the library was not only a place of knowledge, but a place where one could escape into a world of fantasy. At the time, I was into reading science fiction and comics! But the more I read, the more I discovered the lack of compelling stories centered around african-based characters. So I began writing my own stories. I used my love for history to study Jamaica’s culture, music, people and history to create Dread & Alive. Q3. Tell us about the main character Drew McIntosh. A3. Andrew “Drew” McIntosh is an anthropologist, adventurer and eco-warrior. Born in Kingston, Jamaica and raised in the Cockpit Country, he is a descendant of the Jamaican Maroons. At the age of 15, he is given a sacred amulet with untold powers by his mentor, Cudjoe, the wise and benevolent village chief of the Maroons. The amulet empowers him as he fights the forces of babylon in an effort to save the earth and its inhabitants, humans and animals. Drew doesn’t like fighting but he doesn’t like wicked either. He sees himself as the roaring lion, protector of the animal world to which all humans belong. Q4. Every good hero has one, does Drew have a nemesis? If so tell us about him. A. Drew’s nemesis is none other than the nefarious Shadowcatcher, an Obeahman trained in the black arts of Obeahism. Shadowcatcher was born Quaco, the Akan name given to a male born on a Wednesday. He is the brother of Cudjoe, the leader of the Jamaican Maroons who just happens to be Drew’s mentor. In the past, the two brothers ruled the Cockpit Country together, each using their special gift of magic to protect the existence of their people. Cudjoe, was the myalman, practicing myalism to cure all illnesses and remove all curses, while Quaco was the Obeahman, using his black magic to strike fear and cause death in their enemies. When Quaco began practicing the black arts on his own people, Cudjoe had no choice but to banish him from the village, sending him to exile deep inside Windsor Cave. 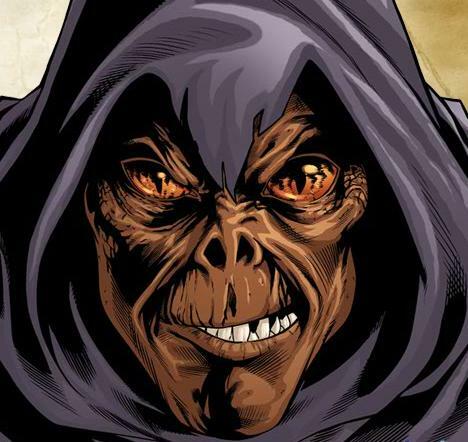 To this day, Quaco has swore his vengence against his brother, taking the name Shadowcatcher as he plots to take back absolute power in the Cockpit Country and to possess the sacred amulet of the Jamaican Maroons held by Drew McIntosh! Q5. Tell us about Dread & Alive: The Lost Tapes? How did it come together? Music has always been a source of inspiration for me, especially in my creative process. As a comic book fan, I’ve always read my comics with headphones on, listening to a song that I thought best fit the mood of the story. So when I first began working on Dread & Alive back in 1993, I told myself that I would create a soundtrack that featured conscious reggae music that fit the theme of the story and the mindset of Drew McIntosh. At the time, I was deep into Bob Marley, Steel Pulse, Black Uhuru, Burning Spear and Third World to name a few. Unfortunately, the world wasn’t ready for Dread & Alive yet, so I took a little break to work on another comic series I created called HITLESS.I decided to create this series as a digital comic book that could be view on both the Sony PSP and the original iPod (pre-iPod Touch). The comic included a soundtrack that represented the theme of the storyline. HITLESS was releases in December 2007 and was an instant hit. I received numerous awards including a major feature in Web Designer Magazine (UK) in January of 2008. I wanted to do the same for Dread & Alive so I setup a plan to launch the actual series in 2010 with the release of Dread & Alive: Issue #1 on Bob Marley’s birthday (February 6, 2010). The release was accompanied by the launch of the official website for the series. On the site, I included a music section so that I could look for conscious reggae music. And that’s when Soul of the Lion reached out to me. Soul of the Lion was working with Zeke Stern who is part of Green Lion Crew. Zeke had told Soul of the Lion about my interest in music for the series. Fortunate for me, Soul of the Lion had heard about Dread & Alive before and had even read some of the pages through the Gleaner in Jamaica. When he called me to share his ideas of how reggae music could be included with the series, we realized we had the very same ideas. And thus, Dread & Alive: The Lost Tapes was created! Q6. You have some very talented people collaborating with you on the Lost Tapes but I note its called vol.1? Is this intentional? Are there plans for more such collaborations? Yes indeed. As long as there is a Dread & Alive story to tell, there will be music to go with it. Soul of the Lion and I have finished the next compilation for Issue #4 and are planning the tracks for Issue #5. We’re looking forward to surprising people with how well the music and the comic book can work together. Q7. Why do you think it’s taken so long for the comics and music medium to come together, when comics and movies have had a tenuous relationship since….. forever!? When it comes to comics, it’s hard to get a comic book artist to step out of their comfort zone and try something new or different. We’re use to sticking to the norm because it’s what everyone does. There’s no surprises to deal with it. Well, I’m not everyone. I get no satisfaction in doing something that has already been done before. I want to push the limits. And, as an independent artists, I can afford to take chances unlike the big boy of comics. Q8. Tell us something you’ve never told anyone else about the dread & Alive series. peace. The amulet symbolizes the peaceful spirit of the Jamaican Maroons (peace side) and their determination to remain free and independent (the lion side) … So Jah Seh! Q9. Before we go is there anything you would like to say to our readers? I would like to give thank and praise to all my fans for being supportive and for recognizing the importance of Dread & Alive as a comic book series. I would also like to say a BIG UPs to all the amazing reggae artists who are the masters of their craft. Anyone can make music but it takes a true artists to write conscious lyrics and melodies that empower, inspire and unite us! That’s the power of reggae! Thank you for your time Nicholas, all the best to you in the future and thanks for meeting with us. 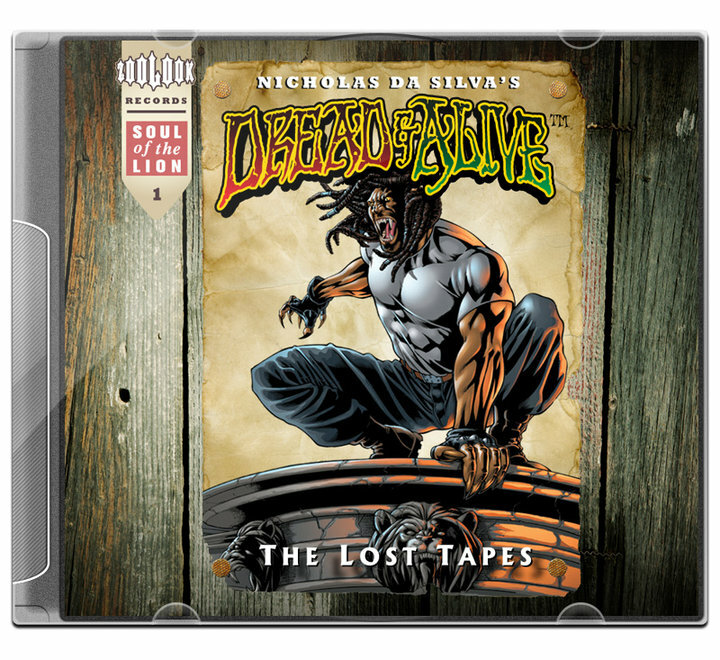 Dread & Alive: The Lost Tapes vol.1 is available on itunes NOW!!! Get your copy!!! !